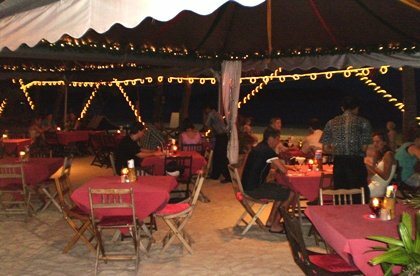 You will need to walk through the alleyway of the Beach Garden Resort in Pantai Cenang to reach the Beer Garden at the end. It's set up right on the sand. 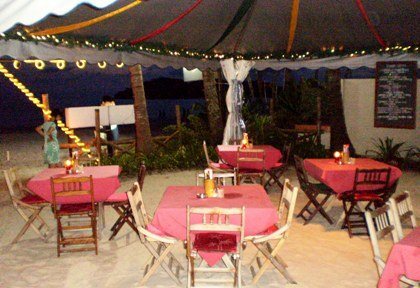 Although there is a light wire and wooden fence to separate the beach crowd from the guests, you will feel you are sitting right on the Pantai Cenang beach itself. While there a restaurant here (The Pavilion) with inside seating, everyone who knows about this place would come to take a seat at the Beer Garden on the beach. While it is open from all sides, there is a canopy roof cover to protect against rain and sun. There are also palm and coconut trees all around adding to the romantic ambience. Our most favorite time here is to watch the sunset while having a cocktail or a beer. So if you really want to ensure a seat by the side of the beach to get the best views, you should either come early or book in advance. The beachside seats are first to get filled up, although you will still get views from the other tables. But note that the tables are on the sand and can tilt if you lean on them heavily. So be careful with your drink slipping off the table. The owner being environmentally sensitive has used all natural materials like wood for chairs & tables, village style thatched roof in some parts giving it an overall rustic and casual look. The name Beer Garden comes from the fact that they specialize in beer and keep a range of beer including draught beer, Tiger, Carlsberg and a number of German beer which you can have by the glass or jug (pitcher). A jug of Carlsberg draught beer would cost about RM33. They import Paulaner Yeast Wheat Beer and Crystal Wheat Beer from Germany. Now coming to food. The Swiss Chef J.J Degraf does emphasize on seafood. The menu is usually a blend of European with Asian cuisine. But there is a range of other dishes as well. Just before the entrance to Beer Garden, a blackboard would display the day's dining menu. Some of the great menu items and our favorites here includes Asparagus Minestrove with Garlic Bread (RM12.50), Cold Roast Beef with tartar sauce and French Fries (RM27.50), Meatball spaghetti on Tomato Sauce (RM26.50), Murgh Makhani (it's Indian Butter Chicken Curry with rice & papad, RM33.50), Spanish Lamb Stew with Taguatelle (RM 36.50) etc. One of the specialties here is the steaks. You can enjoy that with imported German Paulaner brew, draft beer or wine. Pizzas and pastas are also available in the menu. The Pizza Rustica with Mozzarella cheese, salami, onion slices etc is one of the more popular ones here. Another great Italian fare is the Italian Sandwich made with focaccia bread (RM 19.50). You also have choices for camembert, vegetarian spring rolls, vegetarian antipasto etc. So the choices are plenty. They also prepare the Chocolate Mango Trupple cake well... great for desserts. The country breakfast is served on the beach and comes with homemade bread. So overall the food here is nice. The service is average but friendly. Sometimes the staffs do make mistakes with the bills. So do check the bill carefully. Also do not order anything outside the menu, that may be disproportionately costly. On some days of the week, a guitarist plays 70's numbers in the evenings. Beach Garden also offers massage, foot reflexology, shiatsu etc. The Happy Hour is from 3pm to 6pm when discounts are offered on drinks, for example a mug of Tiger or Carlsberg beer would cost RM5 during happy hour. Update April 2013: Effective 4th April 2013, Beach Garden Resort and all its facilities have closed down due to a legal dispute between the hotel management and landlord. Landlord's families and villagers have taken over the property. It is not known if the resort or any of its facilities like the Beer Garden may reopen in near future. Daily from 8am to 12 Midnight. Serves breakfast, lunch and dinner. Happy hours: Daily from 3pm to 6pm. While reservation is not necessary, if you want to ensure a beachside table, then reserve one in advance. If you are staying in Pantai Cenang or Pantai Tengah, you can avail their free pick up service for dinner.